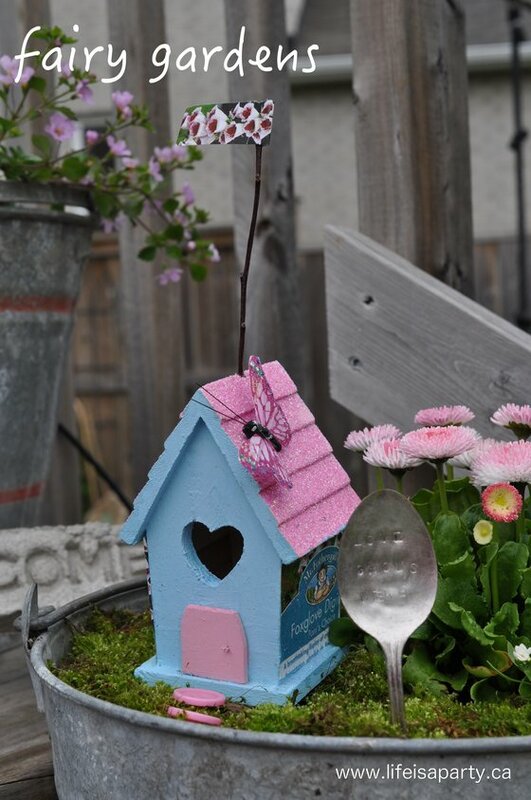 How To Make a Fairy Garden: See how to make fairy houses out of birdhouses and decorate with small plant, moss, a mini clothes line and items from the miniature store. 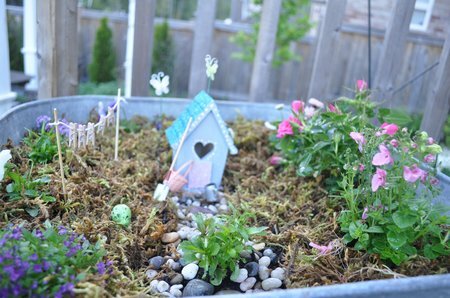 These Fairy Gardens are one of the sweetest projects I’ve ever made, and I was so excited about doing them. We made one for each of my little girls. I also made one just for me so I won’t turn into the bossy mom who controls the craft project by making very strong suggestions to her kids about colour and placement choices…I’m sure you can’t relate. 😉 They were so cute, that I even made one for my own mom and her garden! 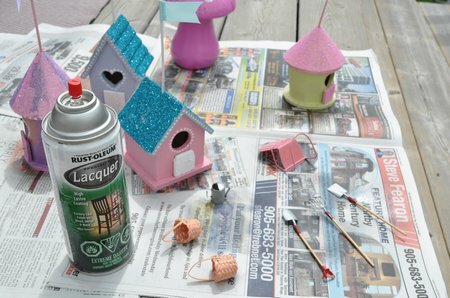 I decided to use dollar store bird houses for the fairy houses themselves. 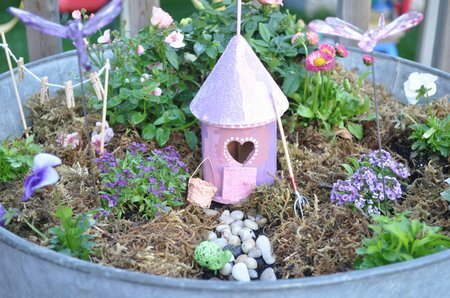 We wanted them to look more like fairy houses, so the first thing we did was saw off the bird perch and replace it with a fairy door. The doors are made out of a small sawed off piece of a paint stir stick. After sawing and sanding them smooth, I nailed the little paint stick door on with a small finishing nail, and left the nail protruding slightly to look like a little door knob. We also removed the eye hook from the top, and I replaced them with small flags made out of a wooden skewer and a piece of ribbon sewn on. 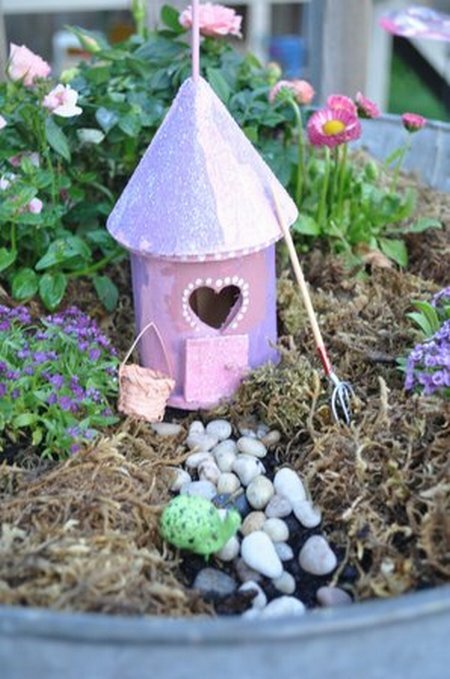 I was also inspired by my Christmas Glitter Houses to add a little glitter to the the fairy houses. After they were painted, next I glittered the roofs and doors, and then applied several coats of clear Lacquer to make them more weather proof. I love them in all their happy pastel colours. 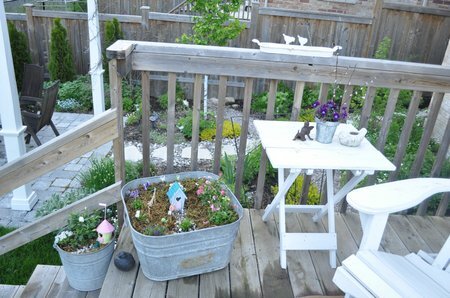 I used vintage galvanized steel wash basins for the gardens, as well as some enamel ware. The one for my Mom is done in a large Terracotta pot, to fit in with her other pots. After planting several small plants around the pot, we covered the rest of the “yard” with moss, and created a small pathway to the front door with pebbles. 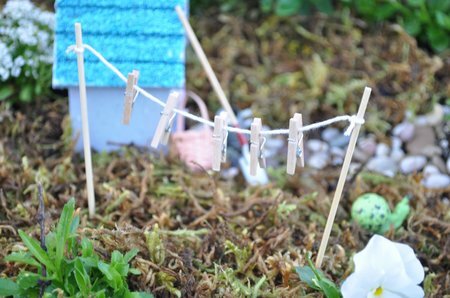 Next we made the clothes pins so the fairies could hang out their washing. The clotheslines are made from two wooden skewers, some kitchen string, and mini-clothes pins from the dollar store. 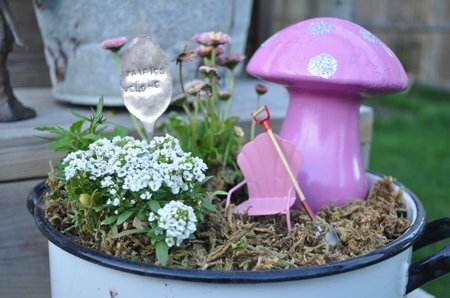 I got so excited about the fairy gardens that I wanted to include a few more little details. 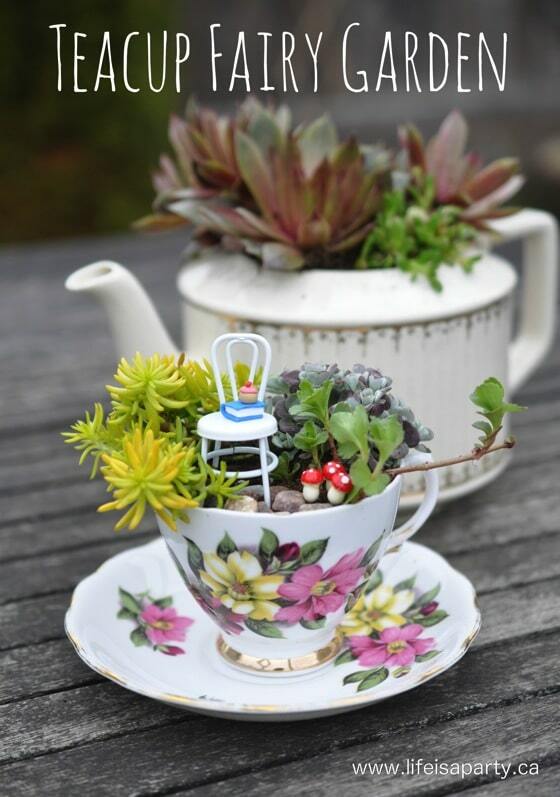 I thought that a miniatures doll house store would be a great source of mini-garden pieces. 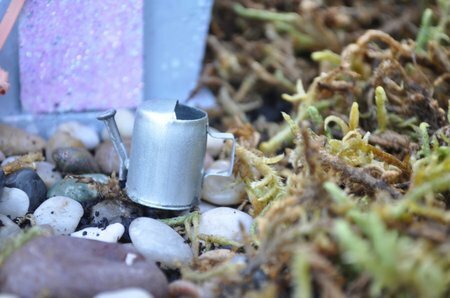 At the miniature store I found this pretty little watering can, in addition to some baskets, and shovels. 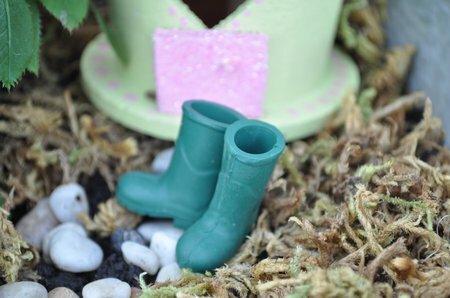 How cute are these little rubber boots! 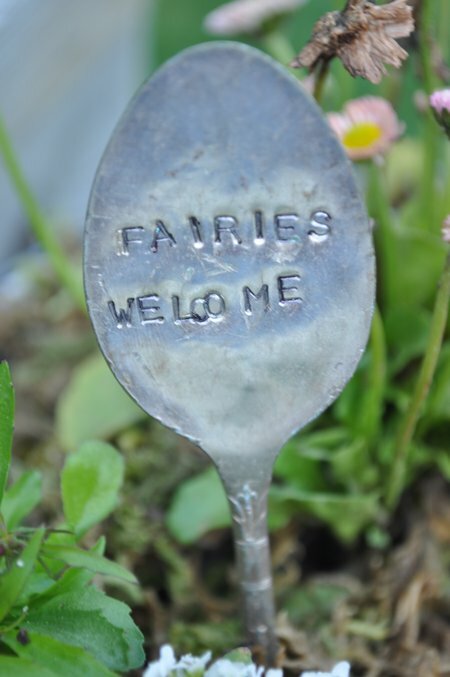 Another fun detail was to use the stamped spoons I made here, as a welcome sign. This pot has a fun toadstool mushroom in it. I found these brown ones at the dollar store. Next I spray painted it bright pink. 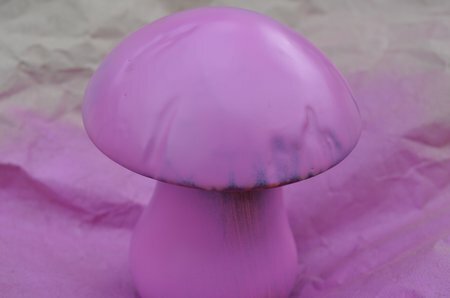 After the mushroom was painted pink, I added glitter dots. Then when I lacquered it, the finish crackled slightly, but I thought it added a little realistic mushroom texture. I love how it looks like a shady spot for a garden fairy to rest on this cute little metal chair after her hard work. The chair is also from the miniature store. Isn’t the mini shovel propped up against it the sweetest? My little girls each made one large garden in the galvanized wash tubs. I did mine in several other little pots. I love the way the pots look all clustered together, like there is a new fairy sub-division that just was built in town. Time to put up the “For Rent” sign and see if any fairies move in! 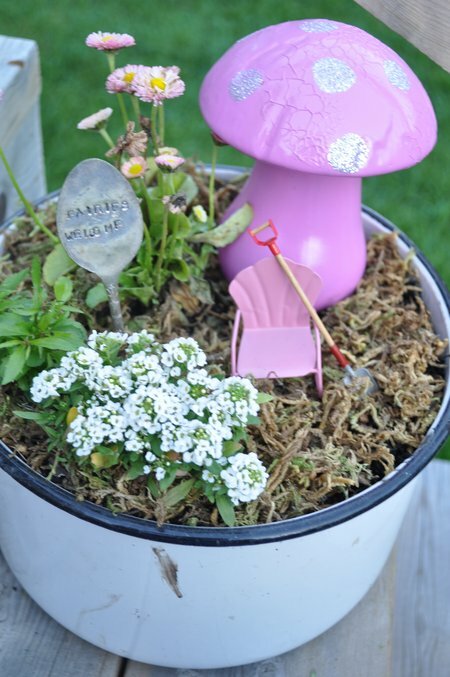 With our own Fairy Gardens, life really is a party! 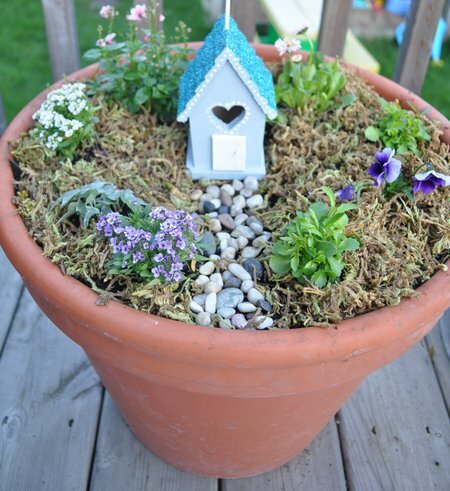 I love these Fairy Gardens! I love how you changed the wooden birdhouses to make them more fairy like. I’m going to do that too! I love the glitter roof- I’ll have to look into that! 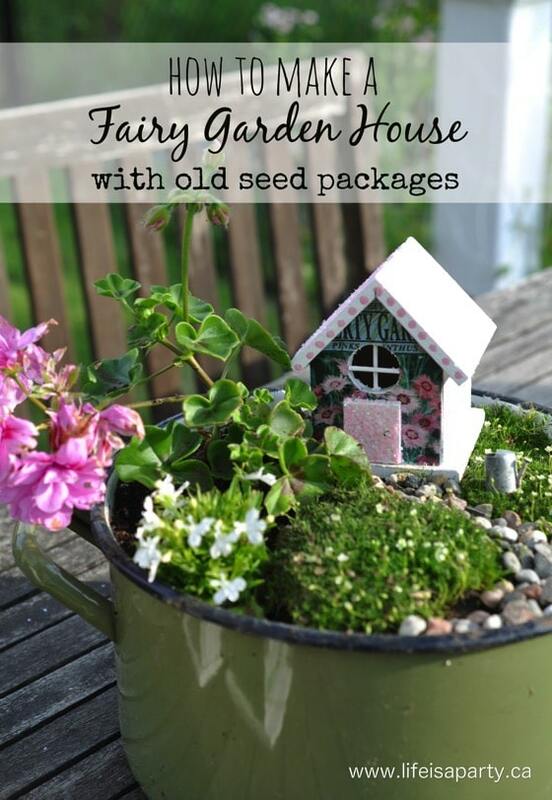 Now I need to find a few containers so that my daughters can each have their own fairy garden. Thanks for sharing! So adorable and creative! I just may have to try this for my neglected container on my front porch! And I think the cracked finish on the mushroom makes is perfect! 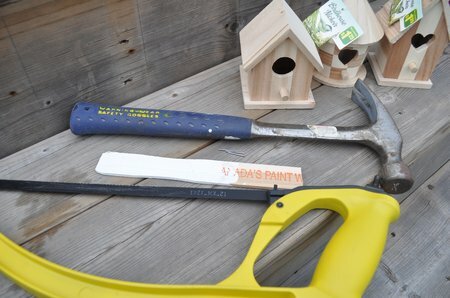 Just found your site via BCD and I had to post – we are in the process of making a fairy garden for my 2 year old! Our local nursery sells beautiful, handmade miniature houses and I’m waiting for my favorite to come back so I can buy it. We’ve bought mini evergreens (available at the nursery also) and have planned out the whole thing. Once the house goes in, we’ll do a similar design to some of yours…using marbles, aquarium gravel, miniatures, etc. 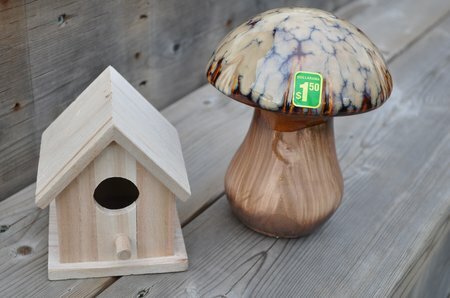 I never thought of the bird houses though – I may have to do this with our semi-broken bird house that we found in our garage! Hubby might have a job this weekend (it needs a new roof!). Thanks for the inspiration! MY FRIEND SENT ME YOUR ARTICLE. I HAVE A LITTLE GRANDDAUGHTER COMING TO VISIT FOR HER VACATION AND I AM GOING TO USE THIS IDEA FOR A PROJECT; SHE IS DEFINITELY A LITTLE “GIRL” AND I KNOW SHE WILL JUST LOVE THIS. THANK YOU FOR THE WOMDERFUL IDEA. Love the idea! good use for extra Barbie accessories too… will have to hunt for 3 containers now – make that 4 because I will want my own too. Is it too late in the year for this? do I have to wait for next spring? Not too late at all, enjoy! How cute, I love all of the details, the clothespins are cute. I love that you found inexpensive items and dolled them up. 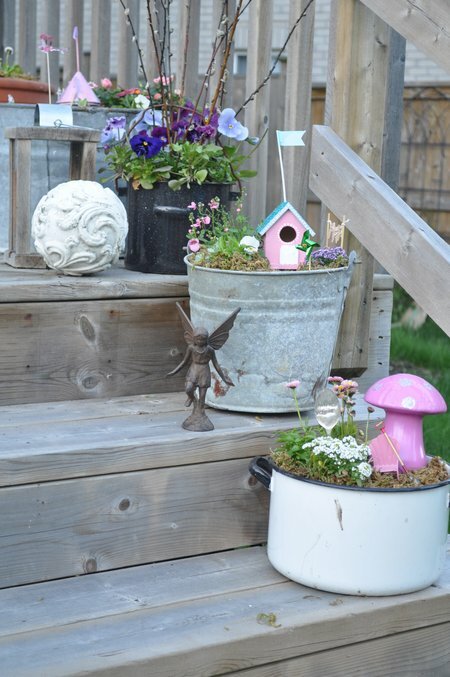 What a fun fairy garden!! You and your family really got involved in this gardening project with full force. I think it’s great that you even made your Mom one! I bet your kids will have many happy memories of this family activity. Oooooooh myyyyyyy GOSH!!! 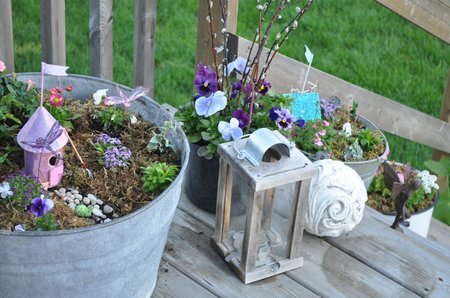 I am soooooo inspired now…I can’t wait for spring now to start my patio garden back up again…that is so adorable and a wonderful project to do with kids! 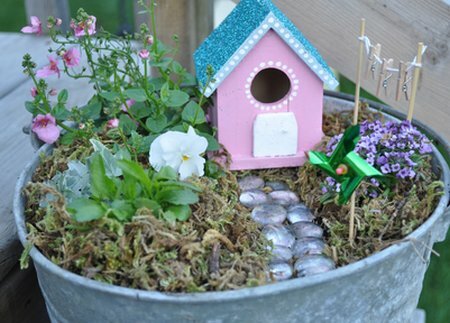 You have inspired me to create my own fairy gardens for my front porch! 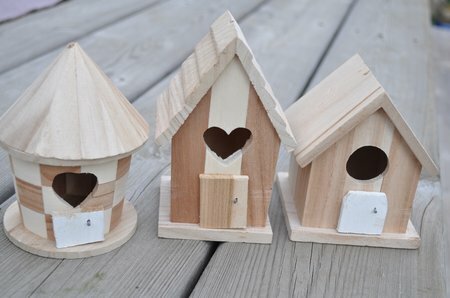 I am going to pick up the birdhouses and hope they are still on sale at my crafts store! I am also posting a link to your site. Hi Lori, Have fun making them, can’t wait to see how they turn out for you. how well do they last in the weather? we are about to start a fiery garden SOON, and wanted to use these kinda houses but worried about the weather. They should be fine for one season, if you’re hoping to get more out of them be sure to seal the craft paint with a clear sealer, and bring them in out of the winter snow. Best of luck. These are soooo cute! I am just wondering, do you fill the pots with dirt? stones?, and do you drill holes in the bottom so they don’t fill up with water? Just wondering! Hi Diane, For sure drill holes in the bottom so they don’t fill up with water. One of my pots this year must not have enough holes and every time it rains it fills up and I have to tip out the extra water -on my list for next spring is to drill more holes in that one. I fill them up with dirt, but some people use other things as filler, since the big ones are so deep. 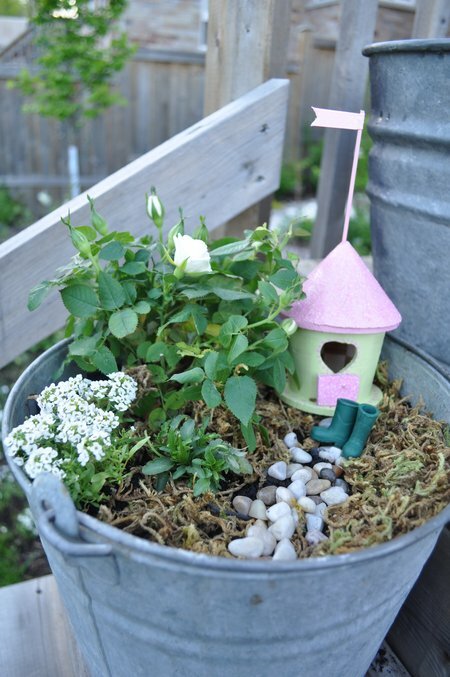 Best of luck with your own fairy garden. Thanks so much Dannyelle!!! Good to know!